Left: The Assemblies of God Assyrian church in Tehran, Iran. The church was illegally confiscated two years ago by the regime, which now wants to convert it into a mosque. Right: On January 7, vandals damaged, robbed, and wrote jihadi slogans on the Light Church in Tizi-Ouzou, Algeria. Kosovo: Muslims urinated in an Orthodox Christian church in Pristina, the capital. Deputy Prime Minister Branimir Stojanovic condemned the desecration of the Temple of Christ the Savior: “Urinating in a sanctuary is shameful, uncivilized, vandalism.” (Last year in Italy, Muslims broke a statue of the Virgin Mary and also urinated on it.) Stojanovic added that, “The quiet observation of the demonstrators by the police, as they entered the temple and urinated is also shameful.” “Serbian [i.e., Christian] sanctuaries in Kosovo are constantly desecrated,” the deputy prime minister said. Algeria: On January 7, unknown vandals damaged, robbed, and wrote jihadi slogans on a church. Furniture, ritual objects, and money worth about U.S. $8,000 were stolen from Light Church in Tizi-Ouzou, around 62 miles from Algiers. According to Pastor Mustapha Krireche, “Thieves broke into the inside of our church through the window, because we installed a reinforced door very hard to force open…. They took the music equipment like guitars, synthesizer, percussion, and sound equipment, plus a printer, the trunk of tithes, a sum of money, and other material.” The assailants left Islamic supremacist graffiti on the church walls including “Allah Akbar.” The church was targeted at least twice before: in 2009, “about 20 Islamist neighbors tried to block the congregation … from meeting for worship”; in 2010, a group of Muslims rampaged through the church building, trying to burn it down and damaging Bibles and a cross. Kuwait: Lawmaker Ahmad Al-Azemi said he and other MPs will reject an initially approved request to build churches because it “contradicts Islamic sharia laws.” He added that Islamic scholars are unanimous in banning the building of non-Muslim places of worship in the Arabian Peninsula. Akba Azhar, a 26-year-old Muslim man, broke into the Victory Church in Kasur and burned copies of the Bible and other sacred books. Although he was captured and detained by a group of Christians who handed him over to police, and although any act of blasphemy against any heavenly religion is punishable by death in Pakistan, police claimed that he was mentally unstable and therefore could not be tried. Local Christians disagree, insisting that he is of sound mind. Several Christians are on death row due to accusations of blasphemy against Islam. South Sudan: Muslims “sent” from Muslim majority Sudan, a country in which Sharia law is enforced, are suspected of burning down a church building in its southern neighbor where there is a Christian majority. On January 16, members of the Sudanese Church of Christ in the refugee settlement of Yida awoke in the morning to find their place of worship in flames. “I learned that those who set our church on fire were sent from Sudan purposely,” reported an anonymous church leader. The fire burned both the exterior and interior of the structure, destroying all of the chairs, a pulpit, and some copies of Bibles in Arabic. The following week his congregation of nearly 200 people held their prayer service in the open air in the remains of the charred church building, an adobe structure. Egypt: A makeshift bomb was found near a church on January 22. Father Paul of the Coptic Orthodox Church in Egypt found what he described as a “foreign object” next to the garbage can outside of the Church of the Virgin Mary in Aswan. He took it to the authorities for analysis, and it was discovered to be a makeshift bomb. Separately, security forces arrested 10 Coptic Christians for trying to build a wall around a piece of vacant land in order to expand their current church into the territory or possibly even build a church. A church already exists in the village of Abu Hannas in Samalout, Minya but it is too small to serve the village’s large Christian population. So the church purchased an unused piece of land next to it in the hope of expanding the current church or building another. 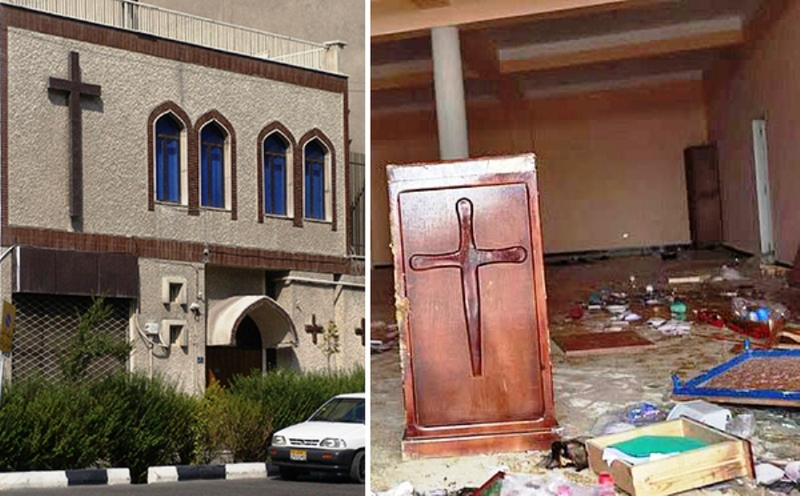 Iran: Authorities from the Islamic Republic are trying to convert the Assyrian Christian church in Tehran into a mosque. The church was illegally confiscated two years ago, when church leaders were told that an Islamic prayer hall would be built there. Indonesia: Authorities in the Sharia-governed province of Aceh plan to remove tents built by Christians to worship in after their churches were torn down late last year by authorities responding to Muslim violence against churches that left one dead and thousands Christians displaced. The government claims that the removals were agreed to, as the tents were built only for Christmas services—a claim that Christian leaders reject. When Sharia police and other officials arrived in early January to remove the tents, the congregation resisted. “Mothers, children, and youths blockaded them. They made their objections clear,” said a pastor. Two church tents were torn down. A week later, another group of reportedly “rich and drunk” Muslims in a car accosted three Christian girls walking home from work. They sexually harassed them, saying “Christian girls are only meant for one thing, the pleasure of Muslim men.” When the girls tried to run away, the Muslims chased them down in their car and ran them over, killing one 17-year-old girl. A Christian man was brutally tortured to death by police in an attempt to get him to confess to stealing from his Muslim employer. Khurram, the son of Liaqat Masih, the 47-year-old slain Christian, was also tortured by police for the same reason; he shared his eyewitness testimony of the beating his father endured before expiring. Police stripped him naked, made him stand on a chair, tied his hands behind his back, and hung him from the ceiling, causing Liaqat’s shoulders to become dislocated. Each time the captive’s feet hit the floor, a police officer would pull the rope to lift him up again and continued applying tension to his arms and dislocated shoulders. Because both Khurram and Liaqat adamantly maintained their innocence during the ordeal, the officers continued to beat his tied-up father with wooden logs until he eventually died. About an hour into the beating, the guards noticed that Liaqat was no longer breathing. The officers then released the tension on the rope and laid the father’s beaten body down in a pool of his own urine, said the son who watched. At the autopsy, doctors concluded that Liaqat died of a heart attack and failed to record the numerous injuries and bruises suffered during the beating. Bangladesh: ISIS claimed responsibility for the murder of an 85-year-old Muslim man for reportedly converting to Christianity. He was found lying in a coffin-like structure with blood on his chest. It is believed that he was stabbed to death while working at his homeopathic practice. According to the report, “Soldiers of the caliphate were able to eliminate the apostate, named ‘Samir al-Din’, by stabbing him with a knife.” Although al-Din’s son claims that his father never converted to Christianity and frequently prayed facing Mecca, One Way Church disagrees, stating that he was just “in a meeting of the church at Gopinathpur village on Jan 3” and that he had told others that his life was in danger. “The local church has shown us papers confirming his conversion to Christianity in 2001,” said local police. Christian refugees from Syria, Eritrea, and other countries are exposed to humiliation, manhunts, and brutal harassment at the camps for refugees by their Muslim neighbors. This also relates to the Yazidi religious minority. The cases when humiliation turns to injuries and death threats are frequent…. According to the Islamic tradition, they [former Muslims, who are at special risk] should be punished, because they moved away from Islam. They are exposed to great pressure and are afraid for their lives, because “renegades” lose any right to it as far as radical Muslims are concerned…. Many Christians who came from the Middle East are suffering from such great harassment that they want to return home, because their situation there seems to them to be a lesser evil as compared with the circumstances in the German refugee accommodation centers. Separately, during a televised Egyptian talk show that aired on January 18, the lawyer Ahmed ’Abdu Maher denounced Al-Azhar, the Islamic world’s oldest and most prestigious university, for continuing to radicalize its students. By way of example, he said: “There is a book in Al-Azhar that calls for the forceful shaving of the heads of the Copts [Egypt’s Christians], placing a sign on their homes [so Muslims know where the “infidels” live], and refusing to shake hands with them.” As it happens, the Islamic State and similar Muslim groups all make it a point not to shake hands with “unclean” Christians—one Egyptian cleric said he finds Christians utterly “disgusting”—and that Christian homes should be distinguished with signs, as ISIS did when it placed the Arabic “N” (nun) letter on their homes in Mosul and elsewhere. Even forced head-shaving is being practiced. Back in 2013, jihadi groups in Libya abducted around 100 Copts and abused them—including by shaving their heads. Iran: Instead of receiving much needed medical treatment, a Christian prisoner was instead given five additional years in prison. Ebrahim Firouzi was first arrested by agents of the Islamic Republic in 2013. He was later condemned by a court of law to one year in prison and two years’ exile. After his sentence ended, Firouzi was kept in prison when new charges of “acting against national security” were levied against him. He remains in prison even though he has been suffering acute pain in the left side of his chest for over a year, and his condition continued to deteriorate in the last three months. Kazakhstan: After he appealed the decision, a court in Astana, the nation’s capital, increased the sentence originally handed to Yklas Kabduakasov, a convert from Islam, from seven years’ house arrest to two years at a prison hard labor camp. The father-of-eight was arrested last year on charges of inciting religious hatred. He was convicted last November and allowed to go home to begin his seven years of house arrest. Local Christians believe the real reason behind the arrest of Yklas Kabduakasov is his conversion from Islam to Christianity and the fact that he was sharing his Christian faith with Muslims. Mali: A Swiss Christian missionary abducted for 10 days in 2012 has been kidnapped again in Timbuktu. On January 8, Beatrice Stockly, a woman in her 40s, was taken from her home before dawn by armed men who arrived in four pickup trucks. Militant Islamic groups are active in the area in which she lives and had launched two attacks in the previous weeks, one of them on a Christian radio station just before Christmas, which left 25 people dead. In 2012, when the jihadis ruled the area, they outlawed the practice of Christianity and desecrated and looted churches and other places of worship. Pakistan: Yet another Christian girl was abducted by a group of Muslim men, forced to convert to Islam, and marry one of her kidnappers. The girl, 15-year-old Saima Bibi, was alone in a village in the Kasur district when she was seized. The family filed a complaint with police against her captors. Her parents hope that providing a birth certificate verifying her underage status will prove useful in the case, as the legal marriage age in Pakistan is 16. Police, however, already confirmed that Saima has converted to Islam and officials have documents proving the marriage. 1) To document that which the mainstream media does not: the habitual, if not chronic, persecution of Christians. 2) To show that such persecution is not “random,” but systematic and interrelated—that it is rooted in a worldview inspired by Islamic Sharia. Accordingly, whatever the anecdote of persecution, it typically fits under a specific theme, including hatred for churches and other Christian symbols; apostasy, blasphemy, and proselytism laws that criminalize and sometimes punish with death those who “offend” Islam; sexual abuse of Christian women; forced conversions to Islam; theft and plunder in lieu of jizya (financial tribute expected from non-Muslims); overall expectations for Christians to behave like cowed dhimmis, or third-class, “tolerated” citizens; and simple violence and murder. Sometimes it is a combination thereof. Because these accounts of persecution span different ethnicities, languages, and locales—from Morocco in the West, to Indonesia in the East—it should be clear that one thing alone binds them: Islam—whether the strict application of Islamic Sharia law, or the supremacist culture born of it.